Made with five Ayurvedic super herbs - Amla, Henna, Fenugreek, Hibiscus and Lemon. Divine Love® Rejuvenating Ayurvedic Conditioner`s natural active ingredients, nourish and rejuvenate healthy, abundant and lustrous hair leaving it feeling soft, luxurious and sensual. This gentle hair rejuvenating and toning conditioner is excellent for all types of hair. Divine Love® Rejuvenating Ayurvedic Conditioner is the favorite of everyone including beauty queens, film stars, royalty and spiritual masters. Divine Love® Ayurvedic Conditioner is formulated in the ancient tradition of Ayurveda, in a base of pure Aloe Vera Gel infused with five Ayurvedic super herbs - Amla, Henna, Fenugreek, Hibiscus and Lemon. Directions : Wash hair with Divine Love® Invigorating Ayurvedic Shampoo. 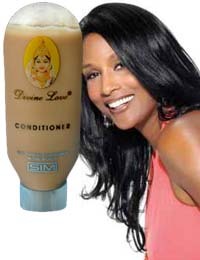 Then apply Divine Love® Rejuvenating Ayurvedic Conditioner, rubbing well into scalp and hair. Wait for a few minutes. Wash hair and repeat if necessary.